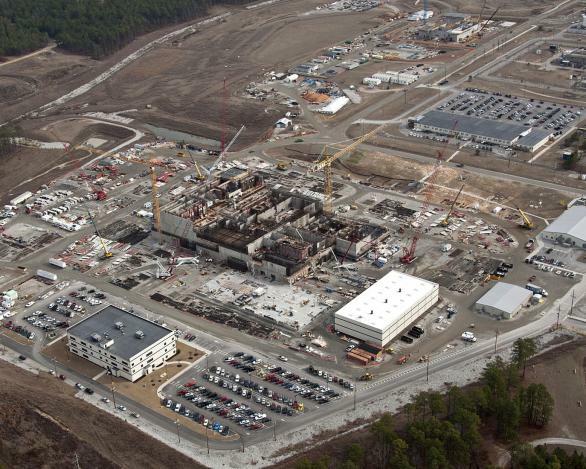 The unfinished MOX fuel facility at the DOE’s massive Savannah River Site, part of the nation’s nuclear weapons complex whose operation has resulted in the deaths of more than 33,000 Americans, according to a new report from McClatchy News Service. That is a fact, established by scientific bodies like the U.S. National Academy of Sciences and incorporated into government-established laws and regulations across the world intended to reduce one’s possibility of receiving unintended radiation exposure. It is a fact recognized, for the most part, even by the world’s nuclear power industry, which generates by far the largest amounts of man-made radioactivity. There is public controversy over what level of radiation exposure kills–controversy typically generated by a self-serving nuclear industry which requires the weakest possible radiation protection standards in order to exist, much less expand, and by the radiation deniers who back that industry–but there is no controversy that at some exposure level, radiation kills. And, of course, the prevailing view (though not incorporated by government regulation) of the NAS and other global scientific bodies is that there is no safe level of radiation exposure, that every exposure, no matter how small, carries some risk of death from cancer or other disease. We all know these truths, but receiving real-life reminders of them is always jarring. Receiving two real-life reminders on a Monday morning is particularly grim, evoking both empathy for the victims but, even more, anger at those who allowed–and continue to allow and even encourage–the atomic age’s legacy of death and destruction. Kudos to those who uncovered what should be scandals on par with the worst abuses of government and corporate wrongdoing in our planet’s modern history, starting with McClatchy News Service, which spent the past year investigating the U.S. victims of the Cold War–those people who worked for our nation’s nuclear weapons program. Titled simply Irradiated, McClatchy’s journalists report that the human death toll from this program was 33,340 Americans. Patriotic Americans who believed they were engaged in the right side (and they were) of a historic battle between two great powers and who also believed their government–our government–would protect them. It didn’t. Neither did the other side’s, but we don’t have many reports on that. *McClatchy can report for the first time that the great push to win the Cold War has left a legacy of death on American soil: At least 33,480 former nuclear workers who received compensation are dead. The death toll is more than four times the number of American casualties in the wars in Afghanistan and Iraq. *Federal officials greatly underestimated how sick the U.S. nuclear workforce would become. At first, the government predicted the program would serve only 3,000 people at an annual cost of $120 million. Fourteen years later, taxpayers have spent sevenfold that estimate, $12 billion, on payouts and medical expenses for more than 53,000 workers. *Even with the ballooning costs, fewer than half of those who’ve applied have received any money. Workers complain that they’re often left in bureaucratic limbo, flummoxed by who gets payments, frustrated by long wait times and overwhelmed by paperwork. *Despite the cancers and other illnesses among nuclear workers, the government wants to save money by slashing current employees’ health plans, retirement benefits and sick leave. *Stronger safety standards have not stopped accidents or day-to-day radiation exposure. More than 186,000 workers have been exposed since 2001, all but ensuring a new generation of claimants. And to date, the government has paid $11 million to 118 workers who began working at nuclear weapons facilities after 2001. Again, rather than me summarizing, read the full report here. These two reports are both examples of journalism at its finest, and both McClatchy and the Center for Public Integrity deserve our fullest congratulations. But reports like these are also all too rare as resources for such investigative reporting continue to decline. The lethal reality of the atomic age probably doesn’t sell newspapers–or web hits–these days. That doesn’t make it any less real. One could hope that such reports would make the radiation deniers reconsider their junk science views; after all, the radiation levels experienced by these victims in India and across the U.S. were nowhere near the levels even they have to acknowledge causes death and disease. Indeed, most of these exposure levels were probably below the level the “hormesis” advocates consider safe, below the levels where these advocates are trying to convince the Nuclear Regulatory Commission to stop regulating. One could hope, but it probably won’t happen. But these reports show why the “nuclear-free” part of a nuclear-free, carbon-free energy system is so vital and why building that system is so essential. Because radiation kills.